Using a checklist is something everyone completing their HSC should be doing daily. Not only does this remind you what needs to be done, but it keeps the simple things routine and can help motivate you. How is it different to a schedule? Well, it is not something that tells you what to do and when to do it, but instead reminds you what needs to be done. By ticking off each thing you complete will motivate you, as you will feel a sense of achievement when you have completed something and cross it off. As the day goes on you will see progress being made and know you are on the right path to HSC success. In our Ultimate Study Notes Booklet for each topic (available in our flipped classroom community), we have a checklist of each dot point and dash point from the syllabus. This is designed so both teachers and students can check off each learning requirement and put the date next to each one as to when it was completed. 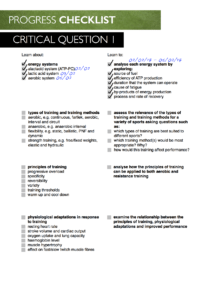 You can download the http://www.improvingpdhpe.com/teaching-resources/improving-performance-ultimate-study-notes-booklet/.